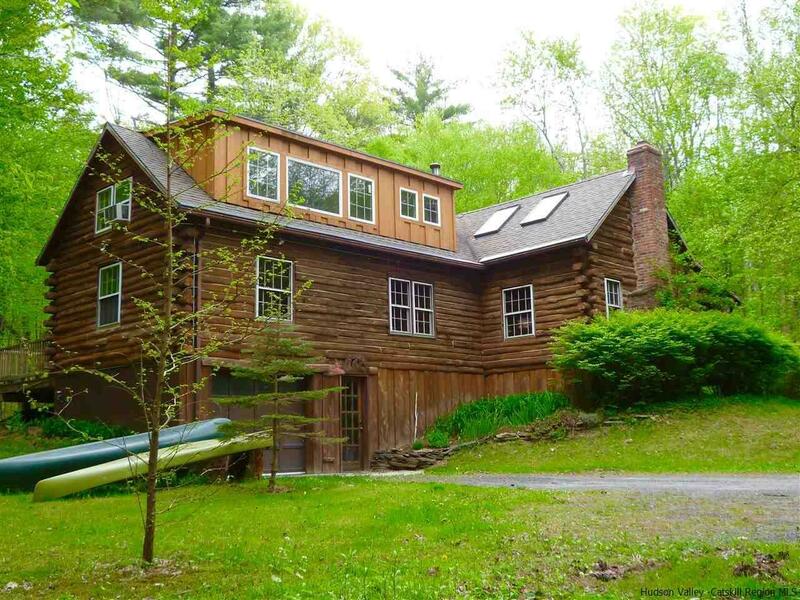 A lovely and very romantic Adirondack style home off Cooper Lake Road in Woodstock. This charmer has all you need for 4 season enjoyment. Stroll around Cooper Lake, garden to your heart's content and laze around on the deck or lawn by your very own stream with mini-waterfall. Enjoy the beautiful stone fireplace in the heart of the living room during the chilly months. The welcoming log-framed covered front porch has plenty of room for dining as well as a great view of the grounds. Total peace and quiet here, yet only minutes to Town by car or bicycle. Once inside the feeling is "log cabin cozy" but with open floor plan and double height living room - great for entertaining. As well as the kitchen, dining, and living areas, there is a very large bedroom on the first floor, which was formerly two rooms (and could be again if one desires) and a full bath. Upstairs leads to a master suite on one end and on the other is a sweet and sizeable loft space currently used as an office. The lower level has a family room which also could become a bedroom or studio/workshop area. Another full bath and laundry room complete this versatile space. Room to roam both inside and out in a magical setting. The pond is another wonderful quiet place to read or meditate.